Statistical Description: Agricultural contributes to 16% of GDP and 49% of employment in India. 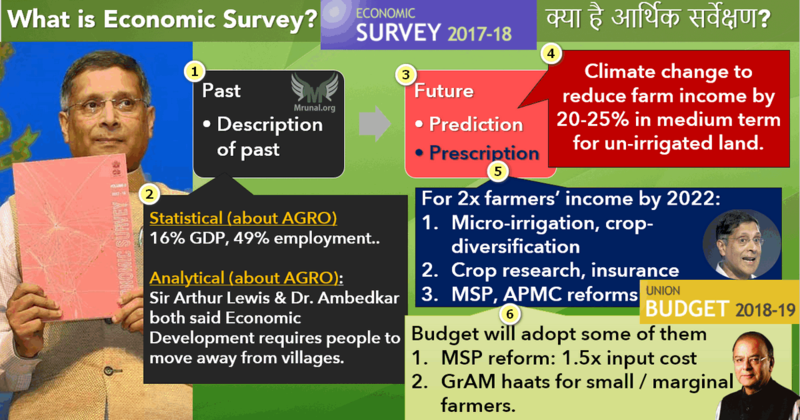 Analytical Description: Both Sir Arthur Lewis (Economist) and Dr. Ambedkar said that for economic and social development, people should shift from the agriculture to mfg/services and from villages to cities. This happened in South Korea and Japan, So they have better standard of living than India. Prediction: Climate change will reduce farm income by 20-25% in medium term for un-irrigated land. Prescription: To double the farmers’ income by 2022, we’ve to focus on Micro-irrigation, crop-diversification, Crop research, reforms in (MSP, APMC) necessary.. Yes, MSP reform necessary. We’ll compute MSP at 1.5 times the input cost, so farmer gets 50% profit on his effort. Yes, APMC reform also necessary, because all small and marginal farmers can’t bring their produce to APMC mandis (as they can’t afford to rent a tempo / tractor) So, we’ll create Gramin Agricultural Markets (GrAMs) in their villages, link it with e-NAM online selling portal. Then, farmers can directly sale to consumers without any APMC middleman’s nuisance & commission. Disinvement i.e. government selling away its shares / ownership of public sector companies to private entities for 1) raising money 2) improving managerial efficiency. Controller General of Accounts sits here. Implementing the recommendations of Finance Commission and Pay commission. National Institute of financial management, Faridabad. Public sector Banks, Regional Rural Banks (RRB). Yes, there is RBI to supervise them, but who appoints the chairman, MD and executive directors in these ‘sarkaari banks’? Ans. Bank Board Bureau (BBB), wherein Dept of Financial Services’ Secretary (IAS) is the ex-officio Secretary. NABARD, IRDAI, PFRDA & NPS related Administrative and legislative matters. Indirect taxes: Earlier there was Central Board of Excise and Custom (CBEC), but Budget-2018 proposed to rename it to Central Board of Indirect Taxes & Customs (CBIC). Legislative matters related to Narcotic Drugs & Psychotropic substances (NDPS), Foreign Exchange Management (FEMA), Prevention of Money Laundering (PMLA), Benami Properties act. International aid given to India. Administrative control over Govt. mints, Currency and security Presses. Dept of Financial services associated with IRDAI & PFRDA. But SEBI & SAT related administrative / legislative matters fall under DEA. Chief economic advisor sits under this department and prepares economic survey. 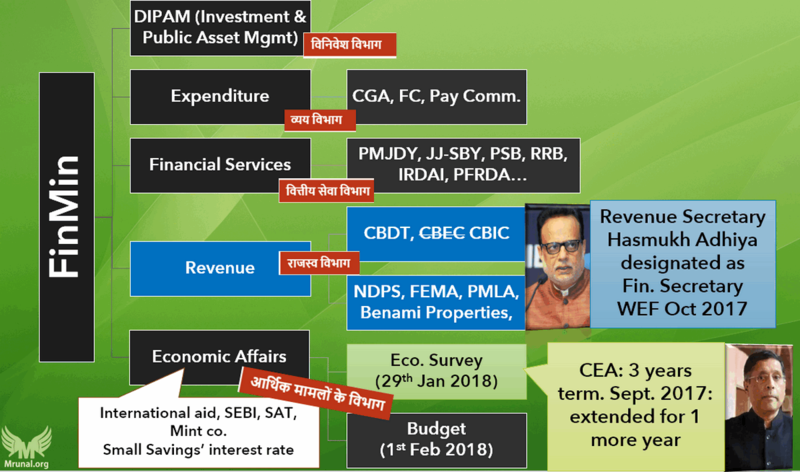 [Latest economic survey was tabled on 29th January 2018]. Chief Economic Advisor to the Government (CEA) is neither a constitutional nor a statutory post. His usual term is for three years. Arvind Subramanian’s term expired on 2017, September. But was given extension for one more year. Rumor market says 1) Arvind is one of the brain behind GST so govt wants his help for a few more months, hence this extension 2) he’ll later join as Chief Economist at IMF once his extended term expires. Finance Secretary: In Finance Ministry, each department’s top-most official is called “Secretary” (usually an IAS). Among them, Senior most is designated as Finance Secy. e.g. Hasmukh Adhiya is the present Revenue Secretary, and designated Finance Secretary from 2017, October. don’t waste time memorizing above months. I only wrote them to provide a chronological perspective. Data, Analysis & Inputs from Economic Advisors (IES officers) posted in individual ministries and departments. Data from Central statistical Organisation (CSO) about IIP, CPI and GDP. Data from Reserve bank of India (RBI) about money supply, foreign exchange rates, balance of payment. Same for other regulators and organizations. Data / analysis from experts, academicians, IMF-World Bank etc.’s reports. and so on…. In ES 2016-17, Jaitley became first Finance Minister to author a section in a chapter of economic survey. But this time (2017-18), he only gave input, didnot write any chapter. Ofcourse, CEA himself will not type all 700+ pages by himself. He has assistance of the IES officers in DEA to draft it. The Draft economic survey is then approved by Finance Secretary -> Finance Ministry. Finally, it’s tabled in the parliament ahead of Budget and then uploaded as PDF in English and Hindi at https://www.indiabudget.gov.in/ . Oxford publication has the rights to publish hardcopy, but their supply is limited, price is high, so many xeroxwalla pirate it, and even sell on amazon. CEA noted this piracy in Economic Survey 16-17 (published in Jan-2017) but appreciated it as a ‘proof’ of his document’s popularity क्योकि piracy Salmankhan की फिल्मो की होती है, अभिषेक बच्चन की नही. But, he forgot to mention that it’s not his popularity but rather compulsion of the competitive exam aspirants which forces them to refer it. When was it tabled in Parliament? Till 2013-14 2014, Feb Single Volume book with 13 chapters and 1 statistical appendix. Adopted Two Volume System like “IMF’s World Economic Outlook”.- Vol1: future prediction & Vol2: Past data description. Theme of the Survey was: Creating opportunity and reducing vulnerability. 2015-16 2016, Feb Two Volumes but no theme. Book had blue cover with an outline of India’s map. We know that survey has to write about 1) future in first volume and 2) past in second volume. But because of Demonetization (8/11/16), CEA said, I’m yet to finish the analyse of economic indicators before and after demonetization. Hence first volume in January and Second volume in August. Uniqueness: First time “Big data analytics” & trivial research findings to fill up pages. Book had PINK cover with an outline of India’s map. Both Vol1 and Vol2 Simultenously released. ….The color of this year’s survey cover was chosen as a symbol of support for the growing movement to end violence against women, which spans continents. – Arvind Subramanian (Chief Economic Adviser). “Word-association”: “pink” is associated with females, and Economic survey ought to have focused on broad and grand terms , so it should be (1) women empowerment or (3) Gender justice. Here, correct option is not even in their ‘zone of consideration’. “Educated-guess”: Newspapers had highlighted Economic survey’s “Son-meta-preference concept & neglected daughters” so it should be #2 ‘girl-child’. Again correct option is not even in their ‘zone of consideration’. If you could confidently eliminate 2 out of 4 options in an MCQ, and then applied such Guessmaster-giri then, (1/3rd negative marking vs 1/2 chances of getting right answer which is in the ‘zone of consideration‘), and repeated this process for another 10-15 MCQs then by the “Law of averages” you might score in positive figure. But for that to happen, the pre-condition is atleast one or two wrong options have to be eliminated first. And the right option has to be among the 2-3 options that you’re putting under the zone of consideration– which was not happening in above “Pink” MCQ. At maximum, they may aid in a very limited extend to a student who already has enough knowledge to eliminate 1-2 wrong options in a given MCQ. So far we’ve learned, what is economic survey, who prepares it, what is its structure and color of the book? In the preface of any book, author will thank the people who helped him, including his wife and parents, but Arvind S. hasn’t done so. There is only one exam-worthy information in the preface (why pink color chosen) and we’ve learned it. Now, scrolling down in the Vol1-PDF, you reach at Page9 – “abbreviations” will start. In competitive exams, they sometimes ask full forms of NITI Ayog, NABARD, IRDA, SEBI etc. So prepare them as your home work. If you’re planning to write mains in Hindi, Gujarati or Marathi then read the hindiPDF’s abbreviation for the terminologies such as ASEAN = दक्षिण पूर्वी एशियाई राष्ट्र संघ. (Mock MCQ) Which of the following abbreviations are correctly paired? NABARD: National Agriculture Bank for Rural Development. HINT: This is your homework- Read the abbreviations in original PDF. “Listicle” is a type of article with a list of interesting information, like “10 ways to become rich”, “5 reasons why jiophone is better than iphone”, “10 coaching classes of Delhi who’ve historically looted and misguided IAS aspirants” and so forth. January 2017: The Economic Survey 2016-17 volume1 gave 8 Interesting facts on Indian economy after the preface. (So, this was the first time ‘listicles’ started in the Economic survey), viz. Arvind S. did railway ticketsales’ heatmap big-data analytics & found that Indians are migrating internally much more than we had previously believed from census-2011 data. International credit rating agencies are giving step-motherly treatment to India. Our economy strong yet we get ranked below China- whose economy is falling. सौतेली माँ जेसा व्यवहार हो रहा है. Only 7 tax payers among every 100 voters. Hence Government has poor fiscal capacity, and poor public service delivery. Demographic dividend will peak first in the coastal states (i.e. they’ll have larger share of older people) then in interior states because interior states have higher total fertility and more young babies right now. India’s interstate trade is more than its foreign trade. India’s GDP rising but “convergence” between rich & poor’s incomes not happening. 9th Interesting fact: While Mrunal doesn’t think this stale list will be asked in future exams but has given the list here as some examiner might use it to add “factually correct” wrong options. January 2018: The Economic Survey 2017-18 volume1 gave 10 Interesting facts on Indian economy after the preface. Post-GST, the number of direct & indirect taxpayers increased. Arvind S. did big data analytics of GST registered entities and found that more workers employed in formal non-agricultural jobs than we had previously thought from EPFO registration data. India’s export structure more egalitarian than others. e.g. In Brazil, the Top1% firms (=Brazilian-Mukesh-Ambanis) control 72% of Brazilian exports, whereas in India, they control only 38%. Meaning, MSME have good share in Indian exports- therefore it’s ‘egalitarian’ because non-crorepatis are also getting opportunities to make money. For this reason #3 is valid. Modi’s textile-industries relief/subsidy package (2016) boosted readymade garment industries but not benefit others textile industries much. Tax dept should avoid litigation / appeals in higher courts, because their success-rate is less. Investment rate is more important than savings rate, for improving India’s growth. Indian State and local bodies collecting less direct taxes than their counterparts in Brazil, Germany. 11th Interesting fact: Mrunal believes that only fact number 1, 4, 6, 8, 9 and 10 seem important for competitive exams. In all types of Government Committee reports, the authors know that ministers, parliamentarians and journalists don’t have time to wade through 500-700 pages of the report, so always first chapter contains the gist or the ‘executive summary’ of the entire document. Same is true for Volume1 Chapter1- it gives gist of the chapters 2 to 9. (But i won’t copypaste it here, because I’ll be giving my own gist in the next article). Here, we’ll only see what Chapter1 says, apart from that. Twin balancesheet Syndrome (TBS): Corporates borrowed money but not repaying back, so both companies’ and public sector banks’ balance sheets have weakened. Board battles at infosys (Murthy vs Vishal Sikka), TATA (Ratan Tata vs Cyrus Mistry). Bad apples like Vijay Mallya, Lalit Modi et al. who run away to foreign countries to escape our law-enforcement agencies. Ofcourse, Arvind S. didnot give specific names, because he’s writing a Government report, but he’s indirectly hinting at them only. Government will have to give truckload of money to Public Sector Banks (PSB) to help them meet BASEL-III norms, but this might increase Fiscal deficit of the Government. TBS, 2g Scam, Coal scam, Anti-Black Money drive etc. Government had to take tough action against corporates. But then foreign investors shying away from India. So, we’ve to use more of “carrot policy” rather than “stick policy”. We should not use ‘blunt’ instruments like bans, quantitative restrictions, stock limits, and closing down of markets. We’ve to make calibrated policies. GST procedural stability is yet to come e.g. Pre-Gujarat election, Modi would cut down GST on textile. GST e-way bill system postponed because server-crash and so on. Ofcourse Arvind S. didnot list those examples, but he icould be hinting at that only. Crude oil and commodity prices could rise because of War in Korea, Political unrest in Middle East (Iran domestic unrests, GCC boycotting Qatar, Saudi & Russia cutting down oil production. Weakening of Chinese economy and consequent repercussions on global exchange rates and international trade. Advanced Economies recovering but 1) flight of capital from India 2) Indian exports might suffer by Anti-globalization and protectionism policies of USA, Europe. Anxiety about TOP (Tomato-Onion-Potato) inflation and climate vulnerability of our agriculture. AirIndia privatization is necessary. Rest is mostly bol-bachchan figures, not very relevant for UPSC MCQs. Modi schemes have increased the Toilet users (SBM), Gas users (PAHAL & Ujjwala), Electricity users (DD Gram Jyoti). But to ensure these users continue to use the aforementioned things, ..
Rest is the usual bolbachchan like “JAM Trinity” , “To reap demographic dividend, we need to ensure our workforce is healthy and educated.” and so on. Apart from this, vol1 chapter1 contains some ‘boxes’ detailing economic-concepts, graphical analysis etc. and analytical fodder for Mains. We’ll study them in appropriate pillars. so, far we’ve reached upto page no. 31 of Volume1. In the next article, we’ll move further to see the gist of remaining chapters. HINT: Is FC constituted annually or at every five years? Is the term “Economic survey” even mentioned in Constitution? Foreign Trade Policy: Dept. of investment and public asset management (DIPAM). Interest rates on small savings schemes: Department of Financial Services. HINT: EPFO falls under Ministry of Labour and employment. First volume contains statistical data of the past year, while second volume contains predictions for the next year. Both volumes are prepared and tabled simultenously in the Parliament. Each year, a specific colored cover is chosen to highlight a specific theme. HINT: go through structure part again. Q. Economic Survey 2017-18 has highlighted which of the following interesting facts about India? Demographic dividend will peak first in the coastal states then in interior states. Top1% of Indian firms command 50% of wealth and 50% of exports from India. The impact of climate change will be three-times more on coastal states than interior states of India. For India’s growth, improvement in savings rate is as important as improvement in investment rate. HINT: go through listicles again. State governments and local bodies should give exemptions and reliefs in their taxes to boost local economy. HINT: Like Gotham, AirIndia is beyond savings, hence Survey recommending its privatization, then it couldn’t have asked Government to give more capital! Arvind S. said Government shouldn’t use blunt instruments and founding interesting listicle #9 that Indian State and local bodies collecting less direct taxes than their counterparts in Brazil, Germany, so indirectly he’s hinting they need to get more strict! Q. According to the latest Economic survey 2017-18, what is the forecasted growth-rate for India for 2018-19? Highway Robber (pointing a gun): Give hint for this MCQ please. Quickgun Murugan: Instead of preparing for IAS, you better operate an S.T.D booth I say. I can draft even more MCQs but not doing it for the lack of time. Besides, by now you should have gotten the idea of what type of information is MCQ worthy and what is not? For the same reason, I’ve deliberately omitted many factoids and analytical points from Vol1ch1, because while they could be important for RBI grade “B” and IES or even Economics Optional Subject in IAS but not for the General Studies. please provide videos of this series sir ! mrunal sir please make video on economic survey like last year. bcoz ur videos are so beneficial. Thankyou Sir for a brief introduction……….! Sir, You are magna carta for us in economics for UPSC. Try to provide lecture series sir. Awesome summary. Thanks a lot for this. it would be “SANJEEVANI” for all UPSC aspirants if MRUANAL PATEL provide lecture series. but should not be so dependent it would be much better to go through last year lecture series and update according to latest data. then we will find that they (mrunal) doing enough for upsc 2018. I am preparing while doing job,and I completely understand the fact that it takes a lot to prepare a material of such high quality despite knowing that, its not going to fetch any considerable monetary benefit . I have read about you and let me tell you ,that you have really won the battle against those coaching owners by creating a sustaining platform which provides such a quality material free of cost to the aspirants. Can anyone confirm me that sir is going to putup video lectures of economic survey or not.? I’m eagerly waiting and time is also close for exams. sir…u can be country s greatest economist. why don’t you join the Ministry sir? he is grt in eco. because he works indivisual.